This might be the craziest TTT yet, but boy does it work for me. 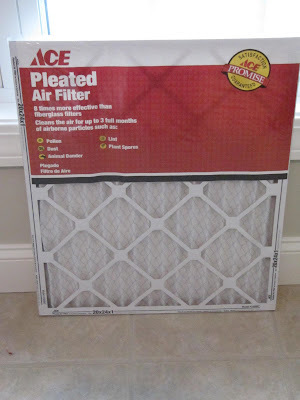 Yes, that is an air filter...you know, those skinny little things you put in your A/C or heat ducts to clean the air. Well, it won't be filtering the air where you sew, but it sure will help you with your sewing!! This is a close up of the label. 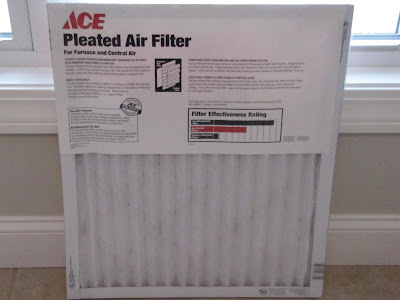 The most IMPORTANT thing is to buy the pleated air filters, because they are made with cotton. Please DO NOT buy the FIBERGLASS filters, because they are made of GLASS. Yep, that's right glass. The man said they are made with glass and sprayed with a substance to keep it together. He looked up the white pleated filters and they are made of cotton...so all safe and sound!! If you want to double check the kind of filters in your stores, just check with the nice man that I'm always bugging...tell him Karen sent you!!! These little gems come in "sew" many different sizes. One side has thin cardboard pieces that act as support, but this is the smooth side that you'll be using. For what?... you say. Well, for this!!!! A mini, portable design board. 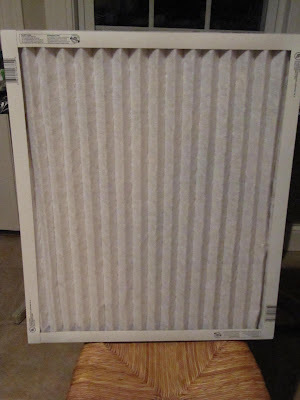 The cotton fabric on the filter makes a great surface for your fabric squares to cling to. You can also use pins too. Makes it so easy to change around a block design or great for those mini quilts that we all love and have on our "to do" list. 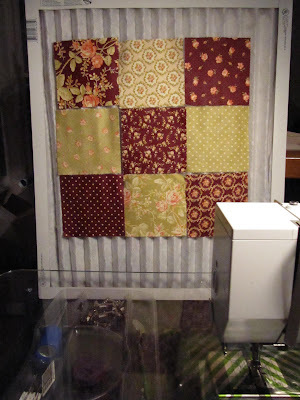 Here is the filter right behind my sewing machine with some 5 inch charm squares on it to show you how easy it is to have the blocks arranged and right there for you to sew. You can keep it off to the side of your machine too. Handy dandy. I know I had a tutorial on another design wall with the pvc pipe that came in 2 sizes, but this one is a no brainer. Just take it out of the package and you're done!! I also think this would be great for retreats. This will fit perfectly in the bottom of your suitcase when you are traveling and if it gets too much wear and tear after your trip...just throw it away. They are about $2.00 - $4.00 each. Some filters are pricey, so watch out. 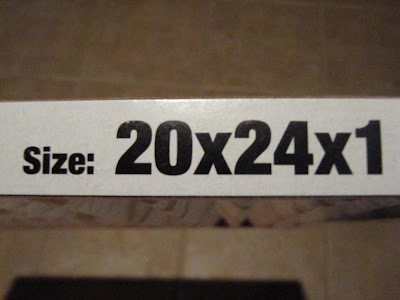 This one is Ace Hardware's store brand. Have a wonderful Tuesday everyone and enjoy a breath of fresh air...filtered air that is!! ps...remember DON'T BUY FIBERGLASS or you'll be very itchy...and mad at me!! Now I said to myslef...Barbara...what has she come up withnow.....and well.....you did it again!! Also just love your makeshift light box. I usually use my kitchen window and my arms get tired! Still loving your new sewing room? That makes a nice minature design board. Thanks for a great idea! That is so clever, Karen! 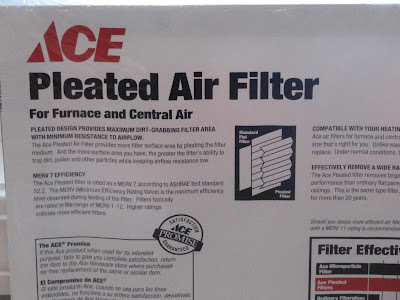 I buy these at Ace Hardware all the time for our furnace, who knew they had another use?! You are amazing...thanks for the idea! Wow, you out did yourself this time! Very clever! I love my design wall that I made using your design wall tutorial. I have the supplies for the large one and I hope to make it soon. Keep warm! It's s snowing outside today here. Happy sewing! I like those signature blocks you have on the design wall! 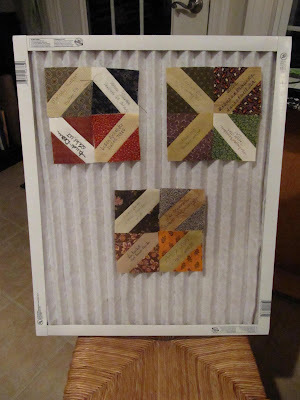 Another fabulous idea - will have to take this to my quilt group next week. Great idea - you are very inventive, to say the least! I have listed your blog on mine and it would be great if you did the same. I don't want to miss a single entry! You had me REALLY smiling with this one. I am going to put "filter" on my shopping list now---love the idea and I have been looking for something easy-simple-and light weight for a design board--this is it---thanks soo much!!! YOU are the mother of invention!